With just a week to go for the Lok Sabha elections in the state, the former Punjab DGP Shashi Kant has stirred a fresh controversy. Kant today spilled the beans by naming “political bigwigs” involved in the drug trade in the state. Kant has also dragged the names of former DGP NPS Aulakh and present incumbent Suresh Arora in the controversy, claiming that they were aware of the links political personalities had with drug mafia. Kant made these disclosures at a press conference held here today. 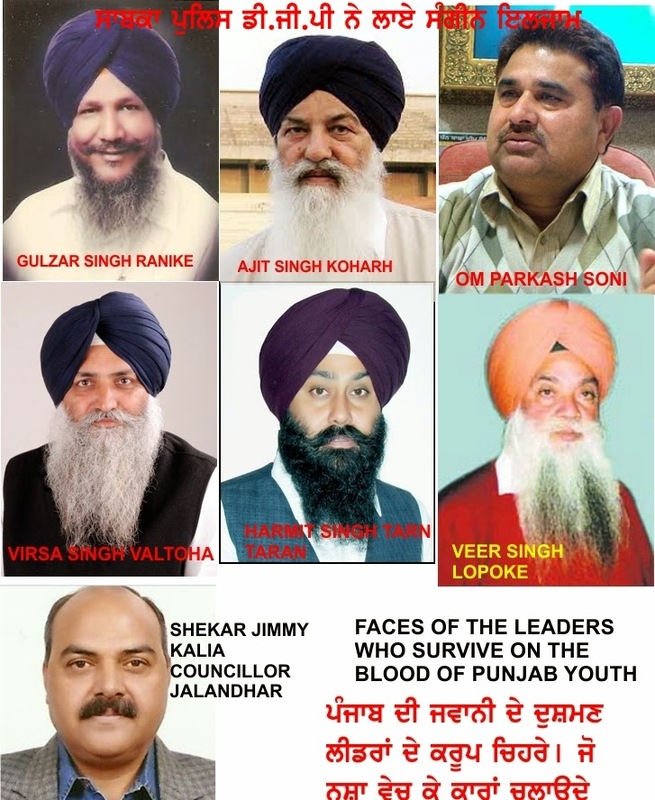 Those named by Shashi Kant include Minister for Animal Husbandry and Fisheries Gulzar Singh Ranike, Transport Minister Ajit Singh Kohar, Chief Parliamentary Secretary Virsa Singh Valtoha, Tarn Taran MLA Harmeet Singh Sandu, Amritsar District Planning Committee chairman Vir Singh Lopoke, Congress MLA from Amritsar Central OP Soni and Jalandhar-based BJP leader Jimmy Kalia. All these leaders have told The Tribune that the allegations are baseless and they will take legal recourse against Kant. Kant clarified that he has taken up the matter as an anti-drug activist and not in his capacity as an Aam Aadmi Party (AAP) representative. Some months back, Kant had claimed that he had submitted a four-page list to the state government. “The list mentioned names of 98 persons, including those of about a dozen senior police officials of Punjab, bureaucrats, leaders of the Congress, the BJP, SAD and NGOs. But till date the government has not taken any action”, he said. 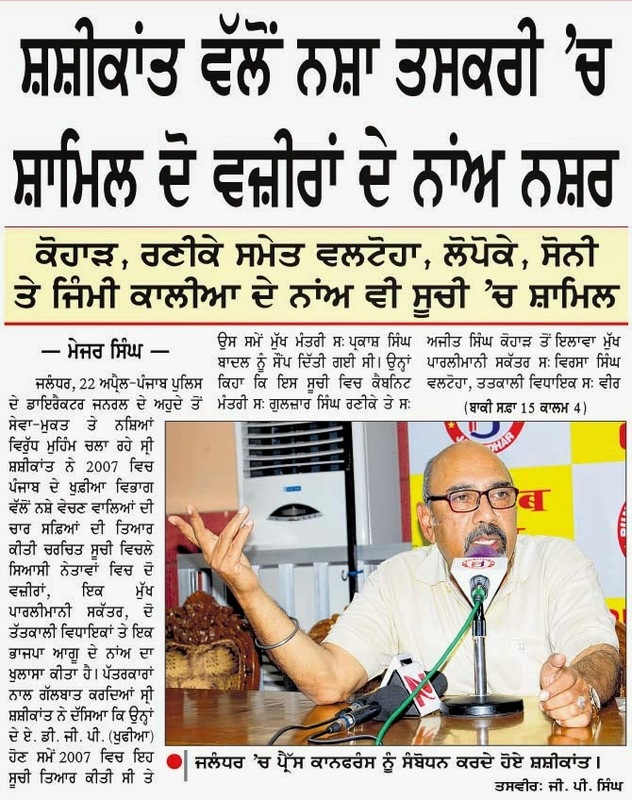 The former DGP said that in the year 2007, when he was ADGP (Intelligence), he himself took the initiative to find out the bigwigs who were involved in drug trade in Punjab and also those harbouring drug peddlers. He said that in 2007, Chief Minister Parkash Singh Badal had snubbed him for preparing the list without his prior consultations. “Kaka aida lista ni banayi diya, pehla aa ke gal kari di hundi hai, fir sochida hai ina cheeza barey (Don’t make such lists at your own level. You should first talk and then think about it). Kant said, “In year 2007, on the basis of secret information that huge stock of the drugs was there at the residence of Gulzar Singh Ranike, Narcotics Control Bureau (NCB) and Enforcement Directorate (ED) were planning to raid Ranike’s house. But, when I apprised the CM of the matter, Badal instructed me to make sure that there was no raid as it would bring bad name to the Akali Dal.” Kant wondered how the Punjab government had given a clean chit to Punjab Revenue Minister Bikram Singh Majithia in the the Rs 6,000-crore synthetic drug racket in which drug lord Jagdish Bhola was the prime accused. While taking a dig at the BJP’s prime ministerial candidate Narendra Modi, the former DGP said it was surprising that Modi was having an alliance with the political party in Punjab whose leaders were involved in drug trade. He also lambasted former Punjab CM Amarinder Singh for not raking up the drug issue during the ongoing elections. Virsa Singh Valtoha Chief parliamentary secretary "Kant is mentally unstable and levelling baseless charges. Someone else is behind the scene, who wants to damage my political career. I will file a defamation case against Kant"
OP Soni Congress MLA from Amritsar central "The allegations are nothing but a bundle of lies. Why Kant remained tight-lipped while he was in service? I will take legal recourse against him"
Ajit Singh Kohar Transport minister "Kant is a Congress agent. I will decide my future course of action after discussions with my lawyers and the party leadership"
"What Kant has said is absurd. It is extremely painful that Kant has levelled allegations of such serious nature without having any proof." "I am surprised to learn that he is indulging in such cheap tactics to tarnish my image. Instead of levelling accusations, Kant should come out with facts"
"I am like an open book and everyone knows my track record. The accusations are politically motivated. Why did Kant not take action when he was a service police officer. I would take legal recourse against Kant"
ਸ੍ਰੀ ਸ਼ਸ਼ੀਕਾਂਤ ਨੇ ਇਕ ਹੋਰ ਅਹਿਮ ਖੁਲਾਸਾ ਕਰਦਿਆਂ ਦੱਸਿਆ ਸੀ ਕਿ 2007 ਵਿਚ ਨਸ਼ੀਲੇ ਪਦਾਰਥ ਕੰਟਰੋਲ ਬੋਰਡ ਤੇ ਇਨਫੋਰਸਮੈਂਟ ਡਾਇਰੈਕਟੋਰੇਟ ਜੋ ਕੇਂਦਰੀ ਏਜੰਸੀ ਹਨ, ਨੇ ਨਸ਼ੇ ਦੇ ਵਪਾਰ ਲਈ ਕੈਬਨਿਟ ਮੰਤਰੀ ਗੁਲਜ਼ਾਰ ਸਿੰਘ ਰਣੀਕੇ ਦੇ ਘਰ ਛਾਪਾ ਮਾਰਨਾ ਸੀ, ਪਰ ਇਸ ਬਾਰੇ ਮੁੱਖ ਮੰਤਰੀ ਨੂੰ ਭਿਣਕ ਪੈ ਗਈ ਤੇ ਉਨ੍ਹਾਂ ਮੈਨੂੰ ਸੱਦ ਕੇ ਹੁਕਮ ਦਿੱਤਾ ਕਿ ਆਪਣਾ ਰਸੂਖ ਵਰਤ ਕੇ ਇਹ ਛਾਪਾ ਰੋਕਿਆ ਜਾਵੇ | ਮੈਂ ਯਤਨ ਕਰਕੇ ਛਾਪਾ ਪੈਣ ਤੋਂ ਰੋਕ ਦਿੱਤਾ ਸੀ, ਪਰ ਅੱਜ ਮੇਰੀ ਜ਼ਮੀਰ ਮੈਨੂੰ ਲਾਹਣਤ ਪਾ ਰਹੀ ਹੈ ਕਿ ਜੇ ਉਸ ਸਮੇਂ ਮੰਤਰੀ ਨੂੰ ਹੱਥ ਪਾ ਲਿਆ ਜਾਂਦਾ ਤਾਂ ਸ਼ਾਇਦ ਨਸ਼ਿਆਂ ਦੇ ਵਪਾਰੀਆਂ ਦੇ ਹੌਸਲੇ ਨਾ ਵਧਦੇ | ਉਨ੍ਹਾਂ ਕਿਹਾ ਕਿ ਮੈਂ ਅੱਜ ਵੀ ਇਸ ਮੰਗ ਉੱਪਰ ਕਾਇਮ ਹਾਂ ਕਿ ਨਸ਼ਿਆਂ ਦੇ ਵਪਾਰ ਦੇ ਖੁਫ਼ੀਆ ਵਿਭਾਗ ਵਿਚ ਮੇਰੇ ਕਾਰਜ ਕਾਲ ਦੌਰਾਨ ਤਿਆਰ ਕੀਤੀ ਸੂਚੀ ਵਿਚਲੇ ਨਾਵਾਂ ਦੀ ਜਾਂਚ ਸੀ. ਬੀ. ਆਈ. ਤੋਂ ਕਰਵਾਈ ਜਾਵੇ | ਉਨ੍ਹਾਂ ਕਿਹਾ ਕਿ ਜੇ ਸਰਕਾਰ ਦੁੱਧ ਧੋਤੀ ਹੈ ਫਿਰ ਜਾਂਚ ਕਰਵਾਉਣ ਤੋਂ ਕਿਉਂ ਭੱਜਦੀ ਹੈ?